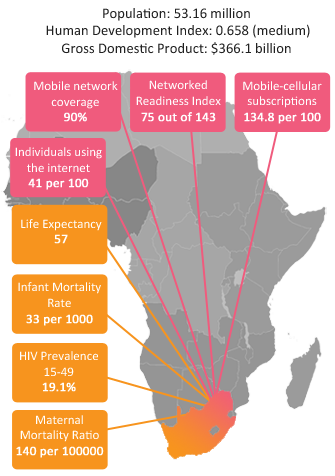 South Africa is rated 65th out of 139 countries in terms of networked readiness (2016), which is high relative to other African countries. It has strong policy & regulatory, and business and innovation environments but rates poorly in terms of affordability, infrastructure and skills. Although it has impressive cell-phone penetration rates, fixed line and mobile broadband are very expensive. While there are some examples of nationally implemented digital health initiatives, there are, generally speaking, vast differences in infrastructure, capacity and digital health maturity across and within provinces in the country and an overall lack of co-ordination. 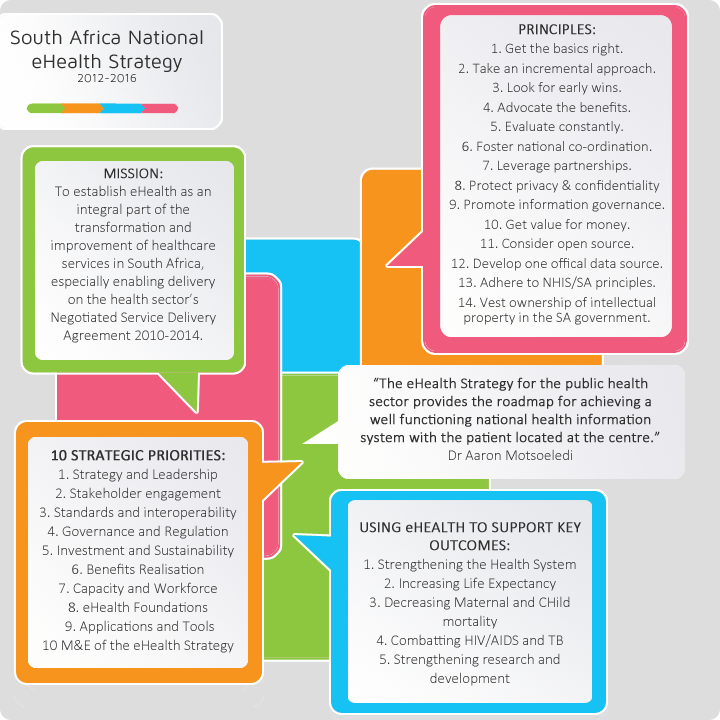 The 2012-2016 eHealth Strategy addresses many of these aspects, with additional detail being provided for mHealth specifically in the draft mHealth strategy. Implemented in all government health facilities nationwide, this mHealth initiative seeks to register all pregnant women in the public health system (app. 1 million per year), provide them with stage-based health messaging and provide a feedback facility. Community health worker mHealth data collection initiative of the National Department of Health. B-Wise is a mobile health portal for young people in South Africa. It provides health information on relevant topics, allows youth to share their health needs and concerns with the National Department of Health, and enables them to connect to local health services.